Today’s IPL clash sees MI play host to RCB who registered their first win on Saturday. MI will look to get back to winning ways having lost to Rajasthan Royals in their previous game. MI coming into today’s game on the back of a loss vs Rajasthan Royals. Apart from Bumrah and Rahul Chahar, none of the other bowlers could keep the runs restricted. Alzarri Joseph was the most affected bowler with Buttler smashing him for 28 runs in an over. On the other hand, RCB registered their first victory after 6 straight losses on Satuday. Their bowling still looks the weak link of the side, having been the root cause for most of their losses. But with a win under their belt, the bowling attack will look to give a much performance today. Alzarri Joseph is set to have suffered injury having landed on his shoulder vs RR and might miss the clash. In that case Lasith Malinga will come in for him. De Kock’s half century will mean that Evin Lewis will have to wait for his chance. Despite losing their first 6 games, Kohli more or less persisted with the same combination. Now with a win under his belt, he will most likely field the same eleven. MI: Rohit Sharma (c), Quinton de Kock (wk), Suryakumar Yadav, Ishan Kishan, Kieron Pollard, Krunal Pandya, Hardik Pandya, Rahul Chahar, Jason Behrendoff, Alzarri Joseph/Lasith Malinga, Jasprit Bumrah. 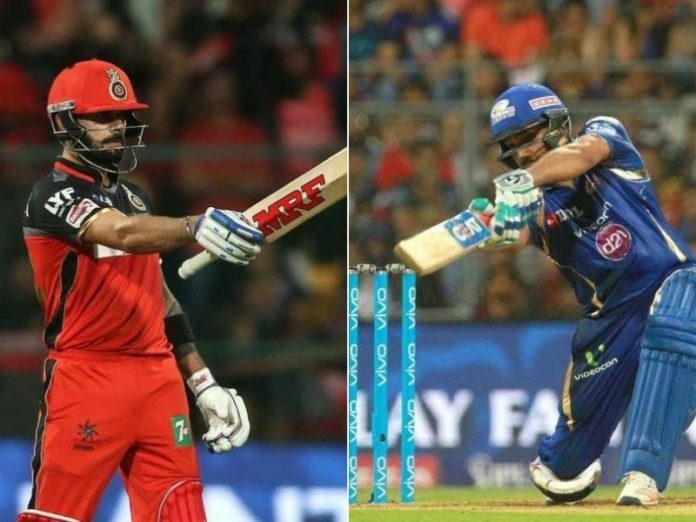 RCB: Parthiv Patel (wk), Virat Kohli (c), AB de Villiers, Moeen Ali, Marcus Stoinis, Akshdeep Nath, Pawan Negi, Umesh Yadav, Yuzvendra Chahal, Navdeep Saini, Mohammed Siraj.